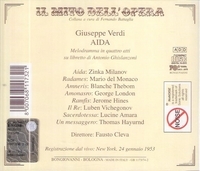 "On the broadcast of 24 January 1953, [Milanov] justifies her continued dominance in the role [of Aida]. The years and multiple repetitions have dimmed neither the refulgence of her tones nor her zeal in performance. In fact, on this afternoon Aida's enamored state and sorry travails would appear to have captured the diva's imagination to an unusual degree. From the first she is in excellent voice; undoubtedly confident of her powers, she sings and interprets with an abandon and immediacy which command our involvement as well. Her reading of 'Ritorna vincitor!' is intensely theatrical. [Del Monaco's] stentorian tenor is the ideal instrument for the concerted numbers (one can actually hear him through the tumult)."